I’ve learned a lot from Lee Taft over the years. In many ways, he’s the closest thing I’ve had to a true mentor when it comes to speed and agility training. One of the most impactful things I’ve taken from Lee’s work was watching him use band resistance to control the momentum of his athletes. And while momentum control is an absolute game changer (especially when it comes to athletes who are coming off an injury), I think there are numerous benefits to using band resistance in your programs. 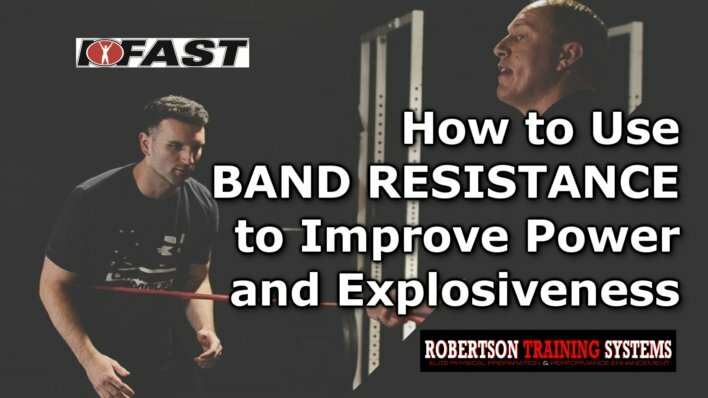 In this short video, I show just a few of the ways you can use band resistance to take your training programs to the next level. Enjoy! Work that we do in the weight room is general physical preparation. A squat or deadlift trains and strengthens the legs, but it’s not always specific to the planes or vectors utilized in sport. This is where a well-rounded physical preparation program comes into play – don’t feel locked into stuff you can do in the weight room. Whether it’s using band resistance, throwing med balls, or incorporating more jumping and plyometric exercises in your programming, find ways to create context within your training sessions. When you combine this “contextual” work with the basic strength training exercises we all know and love, I guarantee you will see a profound impact on your athletes’ performance.